Trump University ripped off people who look a lot like Trump voters. Donald Trump holds a media conference announcing the establishment of Trump University on May 23, 2005, in New York City. Remember Trump University? The now-shuttered endeavor was Donald Trump’s foray into the for-profit-education biz. In return for fees that could reach tens of thousands of dollars, enrollees would get face time with Trump’s supposedly hand-picked instructors. “Copy what I’ve done and get rich,” the Donald barked in one ad for the program. It’s the group of former students that could give Trump something of a campaign headache. Pretrial motions in a California class-action civil case lawsuit alleging fraud are set to begin this May. As Yahoo News pointed out this week, that’s right around when Trump will be attempting to convince voters in almost a dozen states—including California on June 7—that he’s qualified to become president. It’s almost certain he will need to testify at some point. And that could get very awkward. It’s one thing to support a candidate who tells us the system is ripping us off. It’s another to support one who given the chance might rip you off. 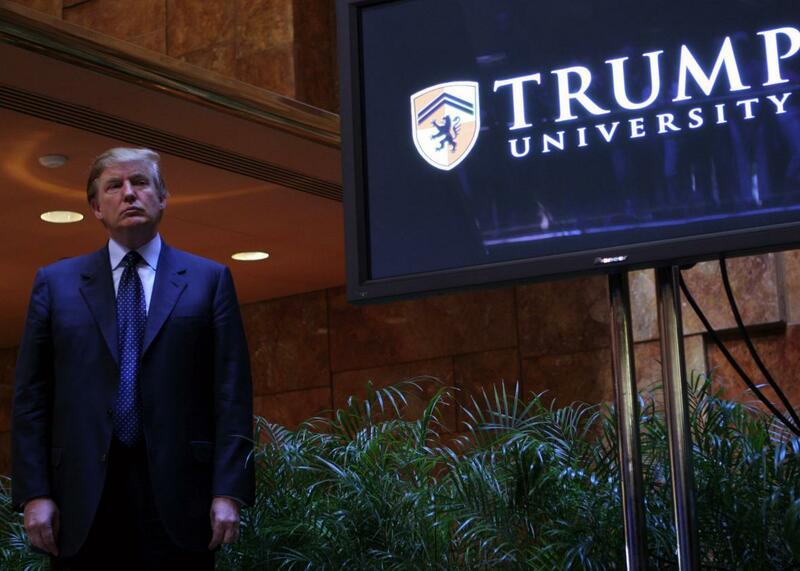 So-called wealth seminars like Trump University did brisk business during much of the aughts. That was when people like Trump and Rich Dad, Poor Dad author Robert Kiyosaki could earn tens of millions of dollars to teach people the supposed secrets of making it big in real estate. “I can turn anyone into a successful real estate investor,” Trumped claimed of his get-rich curriculum. What his program instead showed was that many of the people who actually got rich off of real estate weren’t the desperate folks investing their life savings in homes inflated by the housing bubble. Rather, they were often people who could convince others they had a special secret that could be taught—in return for a fee, of course. And then another fee, for another seminar, after that. And some of the substantive advice the seminars did dispense was hardly worth ​any​ fee, as I wrote last fall. A quick look at the people suing Trump reveals, well, people who might otherwise have been inclined to be Trump voters. They’re people like Tarla Makaeff, a former model and would-be fashion entrepreneur—and currently a yoga instructor—who filed suit against Trump in 2010. She’s now, according to Yahoo, asking to be removed as a named plaintiff in the class-action case, claiming Trump is threatening to financially ruin her. (Unfortunately, the transcript from a December deposition Trump gave in the class-action lawsuit remains sealed.) Other alleged victims of Trump U include Kathleen Meese, a schoolteacher from upstate New York supporting a son with Down syndrome, and Nelly Cunningham of Staten Island, who says she blew all her savings on Trump University classes. “I spent $1,495 on the Trump three-day seminar and $24,995 on the Trump Gold Elite mentorship package, only to be demeaned and belittled. I feel like such a fool,” she said in her court filing. Trump’s support crosses all demographic lines, but his message is clearly tailored for people who feel somehow left behind by the country’s economy of the past decade—or who are concerned they will be left behind in the future. Many earn less than $50,000. An online poll conducted by NBC last summer found a majority disagreed that everyone has a fair shot in today’s economy, but simultaneously overwhelmingly agreed with the statement, “Blacks who can’t get ahead in this country are mostly responsible for their own condition.” Many admire Trump’s business success. Part of Trump’s appeal is an explicit claim that other politicians are corrupt, or lying to us. His wealth, he says, insulates him from doing the same thing. But to hear the former students from Trump University tell it, Trump is just another man on the make. Why Trump might want to remind anyone of all of this in the middle of a hotly contested primary season is a puzzler. He likely could have settled these cases in the past, long before he announced his presidential run. Makaeff first filed her case in 2010, after all, and New York state in 2013. Instead, he’s played hardball—at one point, he countersued Makaeff, alleging defamation. When this case returns to the public view this spring, Trump’s remaining opponents are going to make sure voters know it. Then again, given the Trump campaign’s defiance of the usual rules of politics so far, this case might not matter in the slightest. After all, even when the New York Daily News tracked down former Trump U students filing complaints last year, it discovered some possible Trump voters. As Arlene Cohen, who spent $1,495 on a seminar said, “He’s an amazing person and he might even be a good president.” She just wants her $1,495 back.